Add a unique touch to your baked goods with these Hoffmaster 611120 unbleached natural tulip bake cups! Their whimsical design creates an elegant product presentation, ideal for bridal showers, baby showers, birthday parties, banquets, catering events and more! Each baking cup's walls vary in height, forming a tulip flower shape. Simply add a classy appearance to your baked goods and give an upscale touch to your presentation! These are perfect for me because my them color is "kraft" that cardboard color. Lol, super cute and affordable. Gives that Chabby Chic look that's so popular right now look. We use these baking cups to make jumbo muffins in our store. They give them a fancy look. We have been pleased with them and will definitely continue using. A little disappointed with these. I love the natural aesthetic they give to my baked goods but for the price I was hoping they would be slightly better quality. I would still repurchase again because Webstaurant offers the most reasonable price I can find for these style of muffin liners. This was my first liner that I bought off line. They make life easy! No grease stains pass through and they are in style. People want that "magnolia" look, you got it! I can't tell you how many times I have had to answer where I get these from, and I send my friends right to webstaurantstore.com. They make an ordinary cupcake look amazing and so professional. Also, the cake batter doesn't bleed through these like paper cups. Everywhere I take cupcakes with these, I get great comments. I must admit, my cupcakes are all from box mixes, but with these cups, people think that they are something more, and they rave about the taste too- I think that the aesthetics of the appearance must make them taste better- LOL! Love these natural color liners. Perfect for my carrot cake. Love the look of them and they hold so well. The separate with out a fight which saves me time and headaches. Have ordered twice and will again. I had always used traditional cupcake liners, but upon opening my café, I wanted something unique. These tulip liners are excellent! It makes my cupcakes stand out and look professional. I love them! These tulip liners are so easy to use. You can use them in standard or jumbo tins because they’ll expand during baking to fit. These are also a great way to protect icing during transport and handling, or make explosive large muffins! My absolute favorite cupcake liners, they don't stick to the cupcakes, and open neatly almost like a little plate to eat your cupcake off. They peal off the cupcake easily without leaving crumbs allover, so less of a mess. I use these for all my cupcakes, cornbread, or other baked treats!! These natural tulip baking cups make my ordinary muffins look extraordinary! They really make baked goods more visually appealing...I highly recommend trying them! Webstaurant has a good price, too! I love the unbleached more natural looking baking cup. These are great for when you want to make your muffins or cupcakes look extra special. The paper folds out to make a handy little napkin also! These do not discolor when baking which is also a plus. These are a natural fiber paper for standard cupcakes. The presentation is amazing. The quality is top-notch also. I enjoy using this wrapper for many cupcakes and muffins. I love these liners. I use them when I make muffins or my spice cupcakes. The liners are slightly bigger than the white tulip liners I bought but I still love them. Makes the cupcakes look really nice. A nice change of pace from normal muffin liners. Overly greasy batters show through pretty easily, but most recipes I've used look fantastic in these. Love baking in these and I love how they look. They have that farmhouse bakery look. Classic yet modern. Perfect neutral color to go with everything! These are a great deal. I was having a hard time finding bulk natural cups. While I wish the paper was just a tad thicker these are great paper and they do not rip. I had to try several different amount of batter before I got the results I was looking for. I did have an issue with some batter baking into the folds of the liners. I used these tulip baking cups for the first time today and I love them. They were very easy to use (no sticking together) and look fantastic. These baking cups are AWESOME!!! We use them in our bakery and love their performance and the look. They are high temp rated and are adorable. We serve a lot of muffins in or bakery daily and these are my favorite liners to bake them in. They look beautiful and our customers are instantly drawn to them. I had to return these- they are much smaller than the liners i have been ordering from different sources and did not measure 3 1/2. The color is nice but the liner was just too small and not as described in the way of size. Customer service was good about resolving the issue. Its the only baking cups I use now since I discover this product. I order this one again and again and actually waiting for one to come my way! Highly recommended! This product makes the cupcakes look very elegant and gorgeous! I get so many complements on these cupcakes and how nice they look and how fancy they are! I am very impressed with these liners! And they are very easy to use! We ordered these liners to make our muffins in. We live the look of the natural paper and the pointed edges add a little extra flair. These are perfect baking cups for muffins. They are non-stick, so it eliminates a need to grease them. They are very elegant looking and present nicely on a table. The size is perfect for medium size muffins. These liners are perfect for a cupcake that is slightly larger than a standard size cupcake but not too large. I use these for anything other than chocolate cake. Great quality liners, will definitely purchase these again! These are the best baking cups I have ever used. Baked goods brown very lightly and the paper releases very easily from muffins and cupcakes. These liners are instrumental in producing an attractive muffins. Our muffins sales have increase just by switching to this baking cup. The natural color accents the color of the muffin well. Love the Tulip papers and will only use these from now on and stop with tons of cupcake papers that never get used. Hope you come up with silver one some day. Really nice paper cups. I've switched over to the slightly larger 4'' variety that webstaurantstore offers. But these ones worked great and fit better in most pans. Love the natural colour. I would recommend these guys for muffins rather than cupcakes. Their tulip shape will give your muffins an elegant appearance, but would be too tall for decorated cupcake. I purchased the white and unbleached. They both do what they are supposed to do (contain the batter) but I prefer this one. The natural color looks great holding muffins! These unbleached natural tulip baking cups fit a standard muffin/cupcake pan perfectly! I use them for my blueberry muffins to give them a beautiful look and they peel off very nicely. Great quality and I highly recommend them!!! Nice sized, elegant looking muffin cup. We make pretty big muffins and they hold the batter and bake up very well. Sometimes if we make the muffins too small, the paper will peel away from the muffin. Great product, though. We like using the unbleached natural tulip cups for our muffins. Functionally, they allow us to remove the muffins from their tins right out of the oven. Aesthetically, they lend a nice organic look that compliments our product. Love, love, love these baking cups. They looks great & hold much more batter than the regular fluted cups. They also make for a stunning presentation. The pros: love that these liners are biodegradable, great color addition to the tulip liners we stock from another manufacturer. The cons: weird size that's slightly smaller than a standard baking liner, but still fits in a standard muffin pan, and the paper is reaaaally thin. 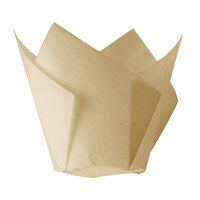 this is a very nice cupcake or muffin paper. it make them look so cute. the custumers really like them. it is a good product for a good price.